If you have already taken the survey about our annual conference, thank you very much! If you have not, we would appreciate if you could please take a few moments to give us your feedback. From February 28 to March 1, the Food Shippers of America held its 61st Annual Conference at the J.W. Marriott Desert Springs in Palm Desert, California. This year brought 1,066 attendees to the conference. Activities started early on Sunday, February 28, when the annual Food Shippers of America’s golf tournament began at 8 a.m. After a welcome lunch buffet and conference registration, the "Sisters Within the Supply Chain Afternoon Tea" event returned for its second year. The First Time Attendee Reception brought a number of first-timers to network and meet peers in the industry. As the first night drew to a close, many attendees could be seen connecting via the FSA 2016 Conference app. The app became the focus of discussion of many attendees. On Monday, February 29, the first session was lead by a motivational speech from Mark Kelly, who is best known for his role in NASA as a retired astronaut and commander, his patriotism in the Military as a captain and his heroism as the husband of U.S. Congresswoman Gabrielle Giffords, a survivor of an assassination attempt in 2011. Mark Kelly recounted his numerous life-altering experiences, from piloting a jet in the Navy during the Gulf War to flying on the last flight of the space shuttle Endeavour. His most trying experience came after his wife Gabrielle Giffords survived an assassination attempt during the 2011 Tucson, Arizona shooting. Kelly’s speech weaved themes of effective decision-making and positive response to sudden, unexpected change through his life experiences, and he even tied in food shipping by reminiscing on transporting food on the Endeavour. "I’m a food shipper as well," Kelly said to elated applause and cheers. "I shipped less food in more miles than all of you in this room." 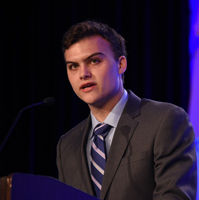 The presentation of the 6th annual John J. Murphy Scholarship directed all eyes to the future of the food shippers industry. 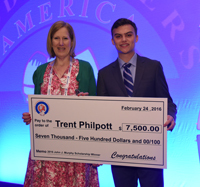 2016’s winner was Trent Philpott, who received the top award of $7,500 to help his studies and professional development in college. The "Supply Chain Industry Informational Fact Sheet" mini-session series returned for its second year, with the first installment hosted by Kevin Lynch of Q Products and Services. The second session, titled "The Perfect Order Challenge: Facilitating Collaboration," centered on a discussion on how manufacturers, carriers and receivers can best work together to create the perfect order and minimize interruptions in shipment. The moderator of the session was Paul Newbourne, senior vice president of logistics operations. Panelists included Sam Burrer, vice president of operations at Dutch Maid Logistics, Debra Shultz, director of transportation at Post Consumer Brands and Kevin Ridings, vice president of transportation & logistics at ES3-C&S Wholesale. The key session takeaway points urged participants to ensure good working relationships, collaborate across all stakeholders, focus on facilitating efficiency and make use of formal action plans, and maximize open two-way communications. 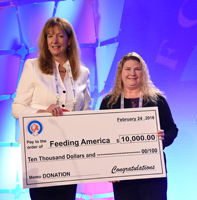 The "Food Shippers of America Gives Back" section presented the Food in Need of Distribution (FIND), Food Bank, Feeding America and American Logistics Aid Network (ALAN) donations, which were presented by Diane Van Wagner, FSA president. Kevin Lynch also returned to the stage to present the FSA golf tournament winners, followed up by Robert Rich III of ROAR Logistics presenting the FSA tennis tournament winners. The second round of the "Supply Chain Industry Informational Fact Sheet" was presented by Tim Fox of Standard Warehouse after an open lunch and an invitation-only sponsors luncheon. The third session, titled "I Can’t Work Like That! Let Me Tell You What is Wrong with That Generation of Workers!" changed the conversation to a discussion on the different generations interacting with one another in the United States’ workforce. Lynne Lancaster’s talk detailed the generations currently working in the U.S., going from Traditionalists to Baby Boomers, Generation X to Millennials, and concluding with the recent Generation Edge. "There’s never been a more important time for informal communication between generations," Lancaster said. "To Bid or Not to Bid. That is the Question" marked the fourth session of the day, and shifted gears to another key issue in the supply chain industry: bidding. Rick Blasgen, president and CEO of the Council of Supply Chain Management Professionals (CSCMP), moderated the panel, with Gary Bleazard, vice president of Fleet and Co-Manufacturing at Coca-Cola; Mike Eggleton, Sr., president at Raider Express; Mike Pecchia, vice president of revenue accounting at Celadon Trucking Services; and Michael Lowe, transportation and warehouse manager at Bush Brothers & Co. serving as panelists during the discussion. The session’s diverse group of panelists allowed for shipper, carrier and manufacturer voices of the conferences to be heard loud and clear as panelists discussed varying questions ranging from what 3PLs could be doing better to the changing food safety laws. "Transparency is key," Eggleton said. "Share operational data and be forthcoming with that information, and don’t cut rates." Lowe gave general advice to all members in the room, saying, "You want to reinvest yourself when you’re in a good position." Erica Orange and Jared Weiner of The Future Hunters lead the sixth session, "Moving Forward Into a Metaspace Economy." "Our value is telling you what the broader landscape is going to be," Orange said. "We are taking threats and turning them into strategic opportunities." The presentation argued for the concept of educated incapacity, which claims that professionals and experts know so much about what they know that they are the last to see the futures of their respective fields differently. To alleviate this, Weiner suggested to "value the perspective of someone younger in the industry" and "expose one’s mind to positions and viewpoints that contrast with your own views." Additionally, Orange and Weiner claimed that the Great Recession was not a recession, but a transformation of the economy. The two coined the Metapace Economy, which targets 10 growth areas of the future. During the session, Orange and Weiner described six growth areas: time space, inter space, micro space, green-to-blue space, play space and cyber space. and a comedic performance from master impressionist Jeff Tracta, who performed as everyone from Bruno Mars to Yogi Bear. The final day of the conference began early with the sixth session, this time led by improvisational motivational speaker Avish Parashar. "Ding Happens! How to Improvise, Adapt, and Innovate in an Ever-Changing World" repeatedly involved the audience during the session. "Life isn't scripted," Parashar said. "As much as we want it to be, life is the ultimate improvisation. Sometimes, ‘ding’ happens." Parashar demonstrated two steps to effective, unexpected decision-making: improvise by having fun and resisting the fear of failure; and take action. "The more you can have fun and think quicker on your feet, the faster you can adapt," Parashar said. "Ding moments aren't fun. When you're having fun, it brings creativity to the table." After a third and final "Supply Chain Industry Informational Fact Sheet" hosted by Jim Fowler, the seventh session went over how carriers, original equipment manufacturers and service vendors work together to ensure changing technology and equipment does not negatively affect service. Moderator Jack Porter, CEO of GPorter Group, LLC, guided "Impacting Tomorrow by Changing Today" with four panelists. Participating in the panel were Conal Deedy, director of connected vehicle services at Volvo Trucks, Darrel Hopkins, controller at Prime Inc., Bryan McDuffie, vice president of transportation distribution at Tyson Foods, Inc. and Scott Zeppenfeldt, vice president of operations at L.A. Freightliner. Bob Costello returned to the conference to provide his "Annual Economic Supply Chain Update" for the eighth and final session. The general economic themes for the country showed a fragmenting economy, significant correction of current inventory, soft manufacturing output and the slight acceleration of GDP growth going into 2017. In terms of the supply chain industry, Costello recognized the uneven growth of truck freight volumes, the tightening of OTR capacity, growing revenue per mile for contract freight that is slightly weakening, a continued driver shortage and continued rising fuel costs for fleets. Costello examined the driver shortage in-depth, claiming that driver demographics, lifestyle, alternatives, regulations and responsibilities cause the shortage. Costello did argue that pay increase for drivers has stimulated growth, but suggested that the market should also treat drivers with more respect, hire veterans and offer more at-home time. Diane Van Wagner wrapped up the conference with closing remarks. For now, change still approaches at the speed of light, but a positive outlook could be felt as attendees packed up and departed Palm Desert. 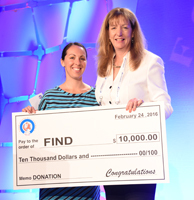 The FSA Conference returns in 2017 in Orlando, Florida at the Hilton Bonnet Creek March 5-7. To view more 2016 conference photos, please access http://nationaleventpix.com/fsa2016 using password fsa2016. You Are Invited to View Photographs from "FSA 2016" group. Thomas Story & Son LLC held its position in C.H. Robinson Worldwide, Inc. (NASDAQ:CHRW) during the fourth quarter, according to its most recent disclosure with the SEC. The institutional investor owned 50,000 shares of the company’s stock at the end of the fourth quarter. C.H. Robinson Worldwide makes up about 1.9 percent of Thomas Story & Son LLC’s holdings, making the stock its 21st largest position. Thomas Story & Son LLC’s holdings in C.H. Robinson Worldwide were worth $3,101,000 at the end of the most recent reporting period. Even in an election year, the clock never stops ticking on the transportation regulations front, especially in trucking—a mode that represents nearly 70 percent of all freight moved in the U.S. Trucking regulations are once again front and center for carriers and shippers and are making an immediate impact on carrier costs, capacity, rates, and relations between shippers and carriers. Gov. Doug Ducey recently named two new members to the Arizona State Transportation Board. Arlando Teller, airport program manager for the Navajo Division of Transportation in Window Rock, has been chosen to represent Apache, Coconino and Navajo counties. He has previously worked for the California Department of Transportation, Phoenix Sky Harbor International Airport and Falcon Field. "I am humbled by the opportunity to serve on the State Transportation Board in order to support not only Navajo Nation projects, but to fully advocate for projects within all of northern Arizona and its rural communities," Teller said. A study by Pew Charitable Trusts has identified "major deficiencies" in USDA’s National Residue Program that tests meat and poultry products for drug and chemical exposure. An orange 2007 Freightliner Century ST120 was reported stolen on Tuesday, March 8, at 4038 Rock Quarry Drive in Dallas, Texas. The truck has "7 FM Trucking" on the sides. TRACER lists a Texas license plate of R190898 and a VIN number of 1FUJBBCG27LW34043 for the truck. DON’T LIKE TRUCKS? STOP BUYING STUFF. PROBLEM SOLVED!" So reads the popular decal affixed to the rear doors of 18-wheelers spotted along Inland freeways. It’s an apt reminder of the integral role commercial trucking plays in the supply chain that delivers to us the goods we take for granted: the groceries bought at the supermarket; the prescriptions filled at the pharmacy; the clothes shopped for at the mall; the textbooks purchased at the college bookstore. That economics lesson apparently was lost on the dozen or so Sierra Club student members who disrupted a forum last week about the Inland Empire’s emergence as a logistics hub.